A cheese lover's Mac and Cheese! 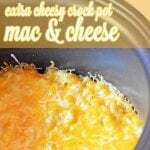 Extra Cheesy Crock Pot Mac and Cheese from Gooseberry Patch's Slow Cooker Fall Favorites is perfect for your next family gathering or potluck with friends! In a bowl, combine cheeses and set aside. In a different bowl whisk together remaining ingredients except pasta. Add pasta and 3 c. of cheese and stir well. Pour mixture into a lightly greased slow cooker. Sprinkle with 3/4 c. cheese. Cover and cook on low for 1-4 hours (depending on your crockpot) until cheese is melted and creamy and pasta is tender. Optional: Sprinkle servings evenly with remaining cheese.